"If I ... would you?" is one of the most powerful invitations you can make. "If I sent you a link to a short video, would you watch it and let me know what you liked best about it?” This is THE simplest and easiest way to invite someone to take a look at Juice Plus+ and/or your business. JPVideos.tv is our product video website designed to be a one-stop-shop for all the best JP videos - 19 short ones and four longer ones at the bottom. When you want to invite a prospect or customer to watch one of the videos, you can send them to JPVideos.tv. 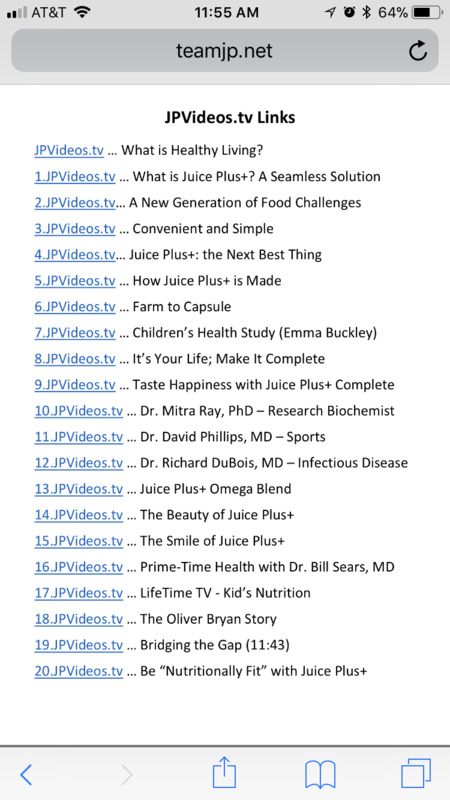 The videos are numbered: you know that the Dr. Dubois video is #12, so you can send them 12.JPVideos.tv. They can watch Dr. Dubois and still see all the other videos below it. Make a list of 10 people (or more) that you would like to share Juice Plus+ with: people you would love to benefit just as you and your family are benefitting. The following are just suggestions; find your own 'voice'. The real point is to get started IMMEDIATELY, without over-thinking who you’re going to contact. This also makes a great weekly team activity. "Hi John! Our family has just started an exciting new journey to better health and I thought of you. If I sent you some information, would you take a look and see if it's something your family might be interested in too? If not, that's perfectly ok."
“Thank you so much! This short video will help you understand why we are so excited: http://19.JPVideos.tv. I would value your opinion on Juice Plus+." “Awesome! Thank you so much! I am looking for 10 participants to give me their feedback on our program and I would love to have you as one of them because I value your opinion. Here is a short video explaining the program: http://9.JPVideos.tv. I would love to know what you think!" "Hello Jill. I'm starting a new campaign and I could really use your help. Text me back so I can give you the details. I think you'll love it - thank you!" "To help me, I'd like you to buy one box of the JP+ Complete shake, drink it twice a day every day for 30 days. Your honest feedback will help us market our campaign more successfully. It's $117 including shipping; it's delicious. I've been drinking our shakes twice a day since [date] and enjoying amazing results. This short video will tell you more http://youtu.be/ohWhSyg5sd8. Can I count on you being one of my 10? Please let me know." Once you have done 10, do 10 more. If you speak with them just share your remarkable experience and get the order information so they can be part of your test market. Do not stay on phone long, you have to make some other calls/texts. The focus is to sell product with the text. ABC close and invite to next event.